Late in 1918, as the infant “Lower Station” (as the new base at Dahlgren was called) grew, it became obvious to Commander Logan Cresap, Bureau of Ordnance (BUORD), that it needed a separate identify from Indian Head. A long established post office designated as “Dido” existed on the reservation, but BUORD planned to remove it in the near future and establish a new post office, tentatively called “Machodoc Creek.” However, postal officials quickly told BUORD that a post office with that designation already existed in Virginia and that another name would be necessary. Thus informed, Cresap sensed an opportunity to memorialize the achievements of “some Naval officer who had been eminent in the development of Naval Ordnance” by lending his name to the new station. He therefore recommended to Rear Admiral Earle that BUORD abandon the Navy’s practice of naming shore establishments after geographic locations, and name the Lower Station after one of these individuals. Cresap suggested Robert Stockton, John Dahlgren, Robert Dashiell, and ordnance expert and Naval Academy professor Phillip Alger as the most likely candidates for the honor. 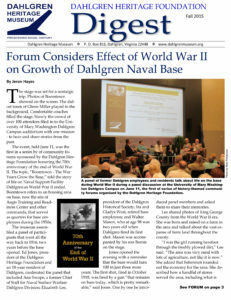 After some discussion within BUORD, Earle ultimately chose to name the new proving ground after Dahlgren, who he considered to be “the father or modern ordnance and gunnery” and a hero who had pulled the Navy out of an ordnance rut in which it had been since the War of 1812.